Keep your eye on the ball, or the prize, or any other metaphor object that reminds you to concentrate on overstretched market fundamentals. There are few things more frustrating than when price action defies all reason, but it can and does happen for years. Most investors eventually simple join the herd. It’s easier not to think, go with the flow. The market always reflects price reality eventually. All bubbles eventually burst. Nobody knows the timing. The savvy investors positions themselves appropriately and simply waits it out. The Federal Reserve was still reinvesting proceeds from the bloated $4 Trillion balance sheet, which provided for intermittent pops of liquidity into the financial market. The liquidity is now “running on empty” at a time where interest rates and inflationary pressures are rising. 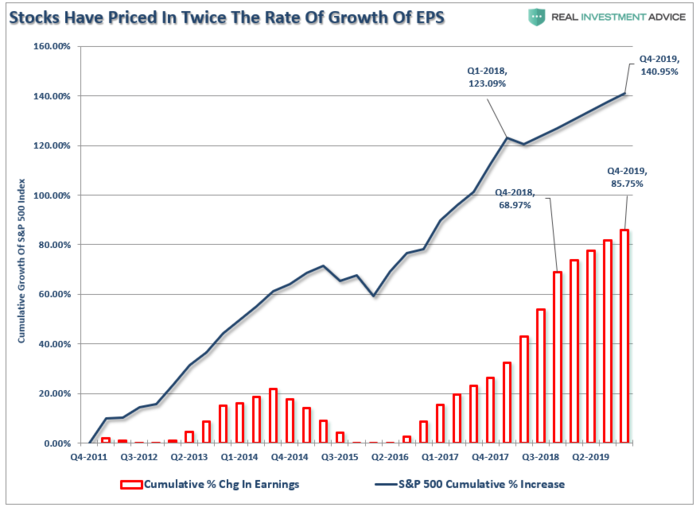 Despite all of the good news from the earnings front, as I stated previously, the surge in the market from July of 2017 had already incorporated those expectations. With current prices expecting things to get even better, such may not be the case as the benefit from tax cuts will begin to fade in Q3 as noted next. Rising interest rates are a problem. While in the short-term the economy, and the markets (due to momentum), can SEEM TO DEFY the laws of gravity, ultimately they act as a “brake” on economic activity. This is particularly an issue when tax cuts have boosted bottom line earnings per share for corporations, but higher rates, oil prices, and tariffs will begin to lessen that benefit. This not only applies to corporations, but to already cash-strapped consumers which have seen their tax cut vanish through higher health care, food and energy costs. The challenge for investors over the next several months will be the navigation of the “seasonally weak” period of the year against a backdrop of warning signals. Importantly, while the “always bullish” media tends to dismiss warning signs as “just being bearish,” historically such unheeded warnings have been detrimental. It is my suspicion this time will likely not be much different.